SO MUCH YARN, SO LITTLE TIME! : Priceless. This shot is just to keep you interested. Nothing happening but DH's sock. 92 Sheets of drywall carried down a narrow staircase. Accurately cutting and hanging those sheets. Scraping up old linoleum floor. 3 different plumbers...all who ripped us off. Staying up till 1:00 a.m. not to knit, but to finish for the drywall taper...priceless??? Ok, really...a knitting question. I must make SCP#2, but what will it be? THIS person will so appreciate a hand knit item...besides the socks she has already received...she will wear it everyday! Handwashing she would dread. If I knit something out of a machine washable yarn, it may accidentaly get thrown in the dryer. So, do I knit a handwash item...and just wash it when I go to visit? Or knit something machine washable? What would you do? You aren't gonna like this answer, but my sister is getting a cotton sweater rather than wool. I know it will get washed in the machine and put in the dryer, so I decided cotton was the way to go. Besides, she tends to always be warm, so a cotton sweater seemed like the best idea. Are you going to post pictures of your renovation project? I do love a good home improvement project (I may actually be addicted to paint) and I'd love to see the huge project you are working on. 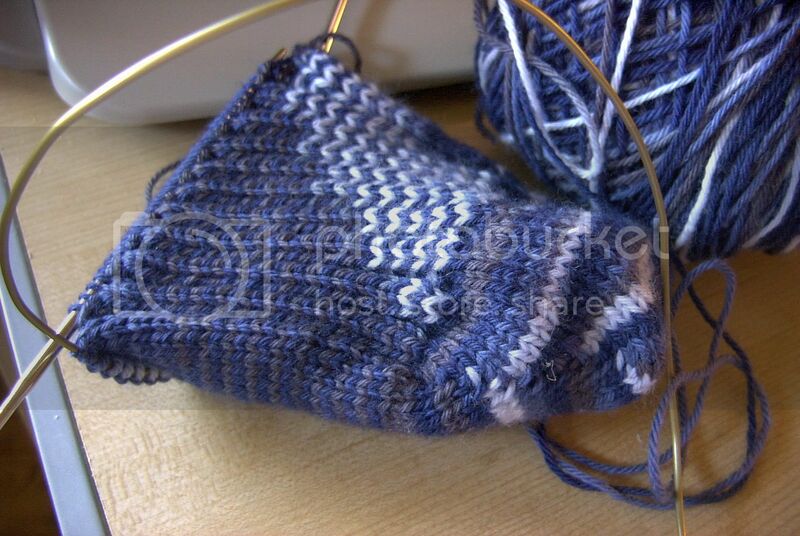 DH's sock is very pretty, even if you haven't been working on it. I'd go machine washable. It's more convenient to knit something the recipient can take care of, rather than check in on it when visiting. The washable version of Cascade 220 is pretty good! Hmm--maybe something that doesn't need to be washed very often, like a shawl or a wrap? If your recipient is the sort of person who would use one, that is. Well, there is always Shine, which is machine washable. Maybe if you have some around you could knit a swatch, measure it, wash it and dry it and see how much it changes. Although if it were me, I'd go with something handwashable and wash it when I visited. Or something that doesn't need a lot of washing, like a scarf. I think it depends on what the item is, and how often you see this person. If you are at her house on a weekly basis, and the item is a sweater -- and you don't mind doing this person's wash! -- then I think you should use a fiber that is beautiful and you love, and tell this person that part of the gift is that you will do the handwashing! How nice would that be! I would totally do this for my sisters, if they didn't live in Minnesota (far) and California (way farther). Sounds like your basement is going well! Sorry about your plumbers-- I just got ripped off by some roofers, so I know what a drag it can be!